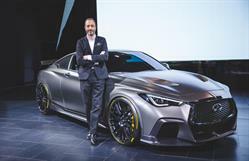 INFINITI executive design director, Canadian, Karim Habib introduced the Project Black S - a radical reimagination of the INFINITI Q60 coupe. Inspired by Japanese motorsport and craftsmanship, Karim Habib introduced the Prototype 9 at the Canadian International Auto Show. The new INFINITI QX50 goes on sale in Canada in June 2018. 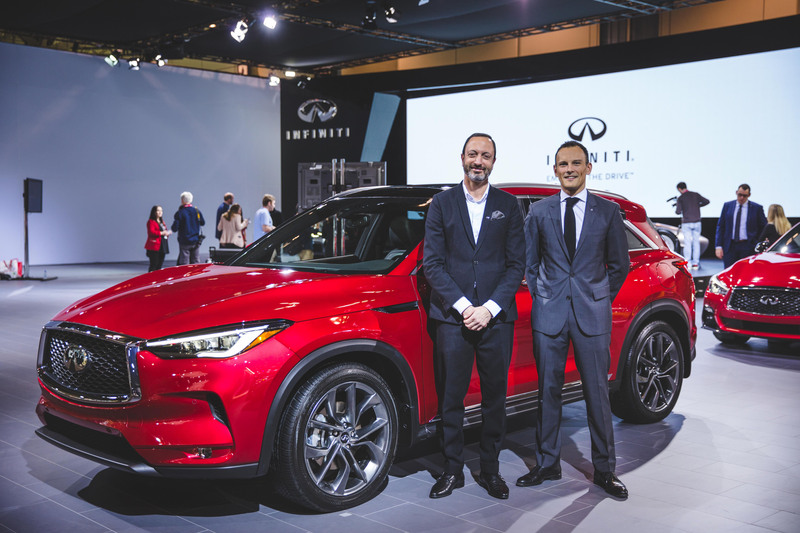 Pictured from left to right, INFINITI executive design director, Karim Habib, and managing director of INFINITI Canada, Adam Paterson. MISSISSAUGA, ON--(Marketwired - February 15, 2018) - The two vehicles making their national debuts during the INFINITI 2018 Canadian International Auto Show (CIAS) couldn't be more different in terms of overall look -- one a slim, silver, open-wheeled vintage roadster, and the other, an aggressive, bolder version of what the public knows as the INFINITI Q60 Sports Coupe. Despite their differences in appearance, INFINITI Prototype 9 and Project Black S are united by INFINITI's past and future motorsport story. INFINITI's new global executive design director, Karim Habib, who calls Canada home, presented the INFINITI Prototype 9 and Project Black S.
"I spent many hours on the Circuit Gilles Villeneuve when I was growing up in Montreal, and I am very excited to present Project Black S -- which is the potential for a new INFINITI performance grade -- as well as Prototype 9 -- inspired by an emerging era of Japanese motorsport. Both concepts share a common ground in auto racing, while their stories remain different." -- Karim Habib, INFINITI Executive design director. Project Black S is a collaborative venture between INFINITI and the Renault Sport Formula One Team, which have been technical partners since 2016. To celebrate this relationship, Project Black S was built to explore a radical reinterpretation of the INFINITI Q60 coupe. "Hinting to the performance potential of a production 'Black S' model, the use of carbon fiber has allowed us to sculpt thin, blade-like design forms, combined with the original Q60's deep creases. This would not be possible with traditional materials, such as metal or fiberglass." -- Karim Habib, INFINITI Executive design director. The extensive use of carbon fiber has allowed INFINITI to sculpt thin, blade-like design forms that would not be possible with traditional materials, such as metal or fiberglass. Prototype 9 - and the crucial question, "What if…"
What if INFINITI was born in the 1940's when races were competed with roadsters, like the ones at the Tamagawa Speedway in Japan? This simple question had a domino effect on the design team at INFINITI and after countless hours of voluntary overtime by a team of passionate employees, Prototype 9 was born. The eye-catching vehicle is a combination of past and future in one car. It is a sleek, open wheeled electric retro roadster prototype inspired by an emerging era of Japanese motorsport. 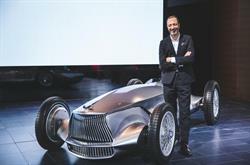 "Similar to INFINITI vehicles on the road today, Prototype 9 required a combination of high tech pioneering spirit and obsessive traditional artistry. The panels were hammered into shape by the amazing craftsmen and artisans found so often in Japan: the Takumi. The vehicle's stunning bodywork is made from steel body panels wrapped around a ladder frame." -- Karim Habib, INFINITI Executive design director. Panel beaters incorporated INFINITI's signature design elements, such as the double-arch grille, 'shark gills' behind the front wheels, a single-crease hood and sharp lines that stretch from front to rear. Articulating the same sense of advanced artistry as INFINITI's production cars and near-production concepts, Prototype 9's cabin was also crafted by the company's interior design teams. EV powertrain; 30 kWh high-voltage battery paired with a prototype electric motor not yet seen on a production vehicle. Produces 148 horsepower and 236 pound feet of torque. Inspired by retro aeronautical designs, defined by smooth, aerodynamic surfaces, long hood and short overhangs, an exposed cockpit, and open-wheeled layout. Prototype 9's cabin has been handmade by the company's interior design teams. In addition to Prototype 9 and Project Black S concepts, the INFINITI stand features two recently launched vehicles, the all-new QX50 luxury crossover offering the world's first commercial variable compression engine -- the VC turbo engine - and the redesigned QX80 full-size, luxury sport utility vehicle, already on sale at Canadian dealerships. The QX50 goes on sale in Canada in June 2018. 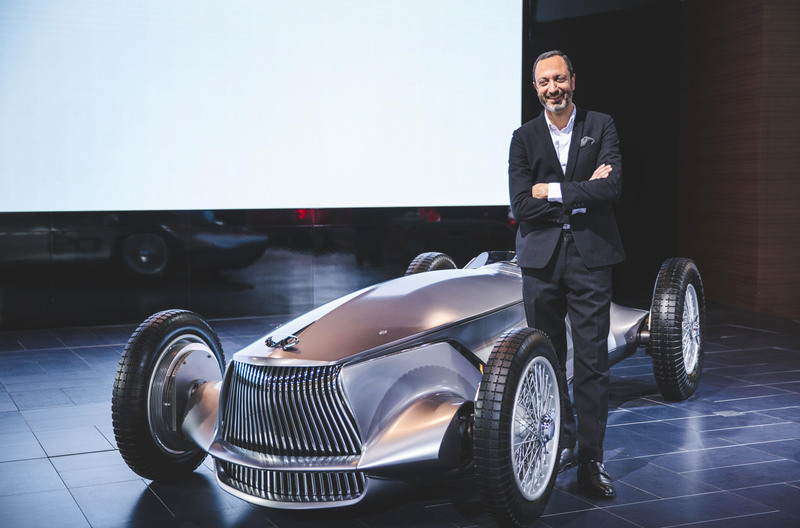 "We are thrilled not only to debut INFINITI Prototype 9 and Project Black S in Canada, but also to have Karim return home for their national reveal. The concept duo exemplifies INFINITI's history in motorsport and Japanese heritage. With the addition of QX80 and QX50 making their Toronto debut, the 2018 CIAS marks a reinvigoration of the INFINITI brand." -- Adam Paterson, Managing Director, INFINITI Canada.